Don’t be molded by the world. Wow, isn’t that a tough one to obey. It’s a reminder that what we think is one of the places of greatest spiritual warfare. Sloppy thinking is more than sloppy, it’s dangerous because we are fed messages constantly that distort God’s truth and holy values. 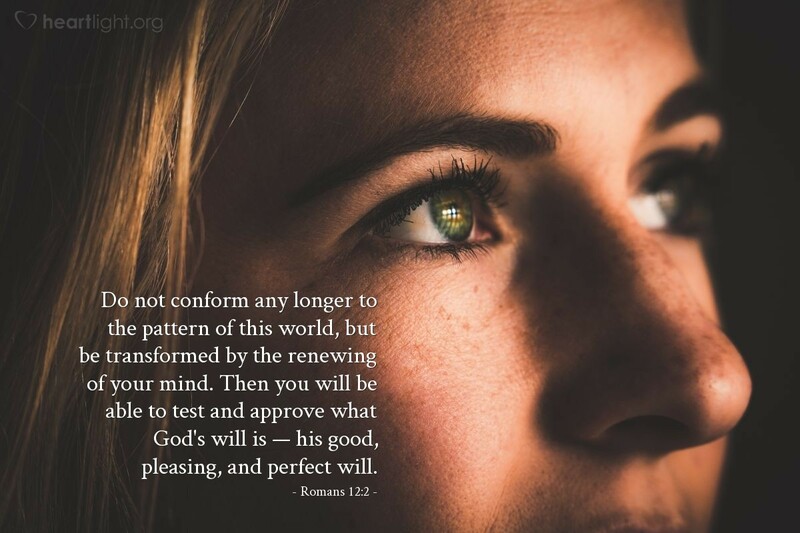 But rather than being incensed by the world acting like the world, let’s be transformed by renewing our minds and doing what Paul said he did — take every thought, every word, captive for Christ. We often think a tithe is giving ten percent of our money, but an even more vital tithe is giving ten percent of our totally undivided thought time to the things of God! O Lord, please guard my soul from pride, my heart from callousness, and my mind from too much focus on unimportant things and not enough on your things. Teach me in my heart what it means to be about my Father’s business, especially in the world of my thoughts! In the name of Jesus, my greatest example of one who knew and lived your will, I pray. Amen.